Note: For the EMOM, find a comfortable yet challenging weight you can sustain for all 12 minutes. The weight is the same for all three skills. For the timed evolution, men’s prescribed weight is 155lb. and women’s is 95lb. 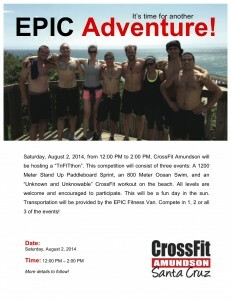 CrossFit Amundson will be hosting a “TriFITthon” this Saturday. All levels are welcome and encouraged to participate. There will be three events in the competition, including a Stand Up Paddleboard (SUP) 1200 Meter Sprint, an 800 Meter Ocean Swim, and an “Unknown and Unknowable” beach workout. Athletes can complete in the full “TriFITthon” or an individual event. Transportation provided from HQ to the competition site by the EPIC Fitness Van. Good runs and safe swims to the brave Athletes participating in this mornings Run – Swim – Run practice workout from 38th Avenue all the way to the Cement Ship in Aptos, CA.